'FORGET HYGGE. 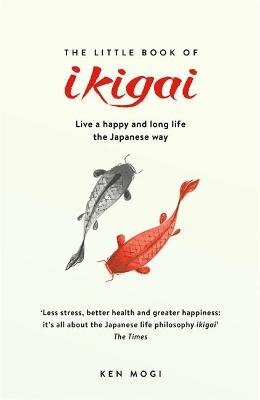 IT'S ALL ABOUT IKIGAI (THAT'S JAPANESE FOR A HAPPY LIFE)' The Times 'WHEN IT COMES TO TRANSATLANTIC ASPIRATIONAL LIVING, IT'S NOW ALL ABOUT IKIGAI' ELLE 'THE NEW LIFESTYLE MANTRA' Sunday Times Find out how to live a long and happy life thanks to the ikigai miracle, a Japanese philosophy that helps you find fulfilment, joy and mindfulness in everything you do. It is extraordinary that Japanese men's longevity ranks 4th in the world, while Japanese women's ranks 2nd. But perhaps this comes as no surprise when you know that the Japanese understanding of ikigai is embedded in their daily life and in absolutely everything that they do. In their professional careers, in their relationships with family members, in the hobbies they cultivate so meticulously. Ken Mogi identifies five key pillars to ikigai: Pillar 1: Starting small Pillar 2: Releasing yourself Pillar 3:Harmony and sustainability Pillar 4:The joy of little things Pillar 5:Being in the here and now The Japanese talk about ikigai as 'a reason to get up in the morning'. It is something that keeps one's enthusiasm for life going, whether you are a cleaner of the famous Shinkansen bullet train, the mother of a newborn child or a Michelin-starred sushi chef. The Five Pillars at the heart of everything they do. But how do you find your own ikigai? How does ikigai contribute to happiness? Neuroscientist and bestselling Japanese writer Ken Mogi provides an absorbing insight into this way of life, incorporating scientific research and first-hand experience, and providing a colourful narrative of Japanese culture and history along the way.